A raucous sold out crowd celebrated St. Patrick’s Day with Murphys Boxing’s 4th Annual St. Patrick’s Day Clash last night at the House of Blues in Boston. In the main event, Murphys Boxing’s own Mark DeLuca (23-1, 13 KOs) scored a unanimous 10 round decision over Connecticut’s Jimmy Williams (16-2-1, 5 KOs) making a successful defense of his NABA Super Welterweight Championship. DeLuca, who came to the ring as The Dropkick Murphys performed an acoustic version of their anthem, “I’m Shipping Up To Boston” put on a clinic outboxing and frustrating Williams from the opening bell and pitching a near shout out with scores of 100-90, 100-90 and 99-91. “I feel like I’m a fairly versatile fighter and I showed that tonight. I felt really good about my performance.”, explained DeLuca shortly after the fight. As for DeLuca’s next opponent, the Whitman, Massachusetts native and former Marine made his intentions clear. It wouldn’t be St. Patrick’s Day in Boston without a visit from Cork, Ireland’s Gary ‘Spike’ O’Sullivan (30-3, 21 KOs) who looked sensational moving down to the junior middleweight division and battering Khiary Gray (16-5, 12 KOs) before referee, Steve Clark called a stop to the action in the 6th round. Going into the fight, Gray was considered a risky opponent for the beloved handlebar mustachioed slugger’s return to Boston. The Worcester native started fast winning the opening stanza with speedy combinations that seemed to catch the Irishmen off guard but by the end of the second round, Spike started a relentless pressure attack and systematically began breaking down Gray. By the time of the stoppage, Gray was bleeding profusely from severe lacerations around both eyes caused by punches. The all action, fan favorite O’Sullivan, who is co-promoted by Murphys Boxing and Golden Boy Promotions, will be back in action this summer in a televised fight to be announced shortly. NABA Light Heavyweight Champion and Murphys Boxing’s own, Charles Foster (18-0, 9 KOs) outworked a game Mike Jimenez (22-2-2, 14 KOs) scoring a 9th round stoppage. Foster’s superior boxing skills made the difference over the hard punching Chicago native who had his moments but ultimately couldn’t find an answer for the talented southpaw’s precision punching. Foster who hails from New Haven, Connecticut, and was last seen on Showtime defeating then unbeaten Alvin Varmall Jr., is confident his performance will lure another Top 10 fighter into the ring in his next fight. 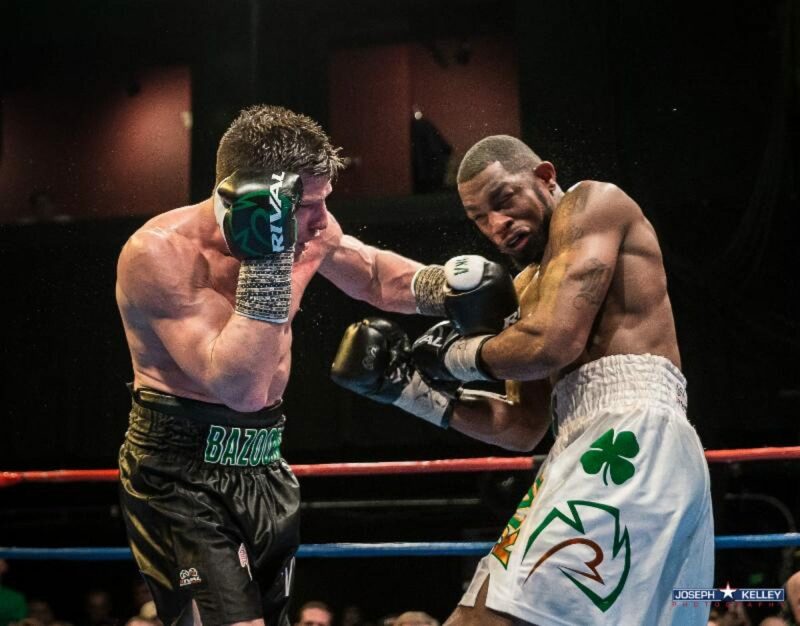 In his first outing of 2019, Gorey, Ireland’s Niall Kennedy (13-0-1, 8 KOs) remained undefeated, making short work of his opponent, former world title challenger, Michael Marrone (21-11, 15 KOs) with a first round stoppage. The heavyweight prospect withstood a haymaker seconds into the fight from Marrone and shortly thereafter answered back dropping the veteran with a well timed right hand. Marrone beat the count and tried for a desperate attack but was caught again and dropped hard by Kennedy and the fight was waved off. With chants of ‘Boom Boom’ from the crowd after the knockout, the big man from Gorey is clearly becoming a fan favorite, having now fought 11 of 14 fights in the New England area and is closing in on a world ranking in the red hot heavyweight division. In keeping with the holiday festivities, a special all Irish welterweight showdown saw Lucan, Ireland’s Noel Murphy (13-1-1, 2 KOs) win a unanimous 8 round decision over Cork, Ireland’s John Joyce (7-1, 4 KOs). Murphy, known more for his boxing than power, surprisingly dropped Joyce twice in the first round and completely dominated him for the rest of the fight with all 3 judges turning in identical scorecards of 80-71. In a rematch of a close battle last year that saw Joe Farina (5-1, 3 KOs) get dropped before rallying to beat Steve Moore (1-7, 1 KO), the South Boston native erased any doubt in their second meeting throwing a constant stream of punches and scoring a shutout unanimous decision, with all judges scoring the bout 40-36, over New Jersey’s Moore in a 4 round welterweight bout. Kicking off the night, James Perella (1-0, 1 KO) had an impressive professional debut stopping Bruno Dias (0-6) in the second round. Dias hit the deck three times in the opening round all from body shots and just moments into the second round, Perella dropped the MMA veteran again with an overhand right prompting the referee to stop the fight before administering a count. The young welterweight, who hails from nearby Mansfield, Massachusetts, had an extensive amateur career and is set to make a quick return to the professional ring as it was announced he will be featured on the undercard of Murphys Boxing’s next event in Melrose, Massachusetts on March 29th. Previous boxing news: Errol Spence: Who Can Beat Him? Next boxing news: PHOTOS: Conlan defeats Hernandez, Mojica Stuns Barnes!